Happy 2015! Of all the dishes I made last year, Cold Kidney Salad in Sesame Sauce from Mrs. Chiang's Szechwan Cookbook totally caught me off guard. Delicious, intensely flavored, and with a texture like cooked shrimp, this was totally out of left field. Kidneys are a hard sell, and sometimes I try a kidney recipe that ends up tough in texture and coarse in flavor. But this dish was such a success that I wanted to share it with the world...discreetly. So I brought it to a holiday party, calling it "Pork Lettuce Wraps in Sesame Sauce." 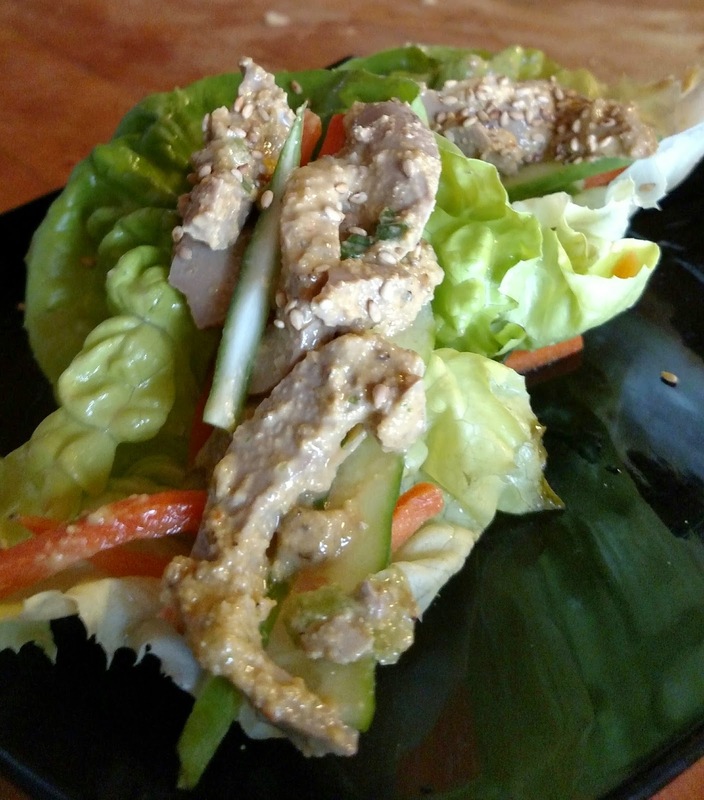 Bright notes of garlic, chile, and ginger seasoned the pork kidneys, while crisp Bibb lettuce and julienned cucumbers and carrots added crunch and texture. Aside from a few friends who always avoid spicy foods, the wraps really went over well. People were surprised at the end of the party when I told them it was sliced kidney, but no one found it anything to gag over. My hope is that this might make a few people more open to trying organ meats in the future. On a side note, the dressing for these kidneys came out much creamier than last time. I'm still learning about all the different brands of Asian condiments out there, but clearly there was some variation from my first attempt, which was more of a thin marinade.